Did you know 3500 do not return home due to car crashes taking place and many people have their lives affected due to car crashes. Most of us know someone who has been affected by a road crash, either by being injured themselves, or through suffering a bereavement or injury to a family member or friend. This foundation has been formed due to loss of the life of Suraya. As more and more people in developing countries are coming out of poverty, many can afford to buy cars. Due to lack of proper road design, road safety awareness and road education accidents are on the rise in these countries as a result 90 percent of the world's accidents are in the developing countries. If the trend continues deaths due to car crashes could be fifth major cause of deaths in the world by 2020.
WHO had recognized that the danger car crashes could pose in the future thus launched an initiative on May 11 2011 to spread awareness as much as possible. You can do your part by heading to Decade of Action 2011 - 2020 website and purchasing a tag for you and you friends. Together we can save lives by spreading the message of safe driving! First Road Safety Comic Released! Our first comic issue titled "Missing Tyre!" has been released today! More than 20 hours of work and effort has been put into it by the team mainly the illustrator Rayden Kusumo. 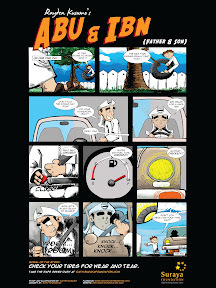 The comic series would focus on elaborating the road safety features on Road Oath. Click the above icon to take you to the comic page. Discuss this here on our facebook. Please provide feedback on our main facebook page. Spread to your friends and families.